I’d been in the relatively recently opened Jamie’s Italian in the Assembly Rooms in Edinburgh for a quick lunch before and I had thought is was OK. We had friends visiting from Lancaster who were keen to try it so we booked an evening meal there – it’s very busy and even booking several weeks in advance, we couldn’t get the time we wanted on a Saturday evening. We arrived a few minutes early and were asked to wait in the bar. We ordered drinks and I asked them to put it on our tab. Normally, this involves simply giving your name and maybe signing a bill. Here, I had to hand over a credit card which they put in a case and they then gave me the key to the case. This I did not like – leaving aside the fact the they obviously had a mechanism to open the case and so get to my card, the signal this sent was – “we don’t trust you” – not a good start to the evening. We were shown to our table in the lower part of the restaurant, by the kitchens at the time we had booked. The menu is, I believe, standard across the chain – a selection of antipasti, pasta, and main courses with a couple of specials each night. 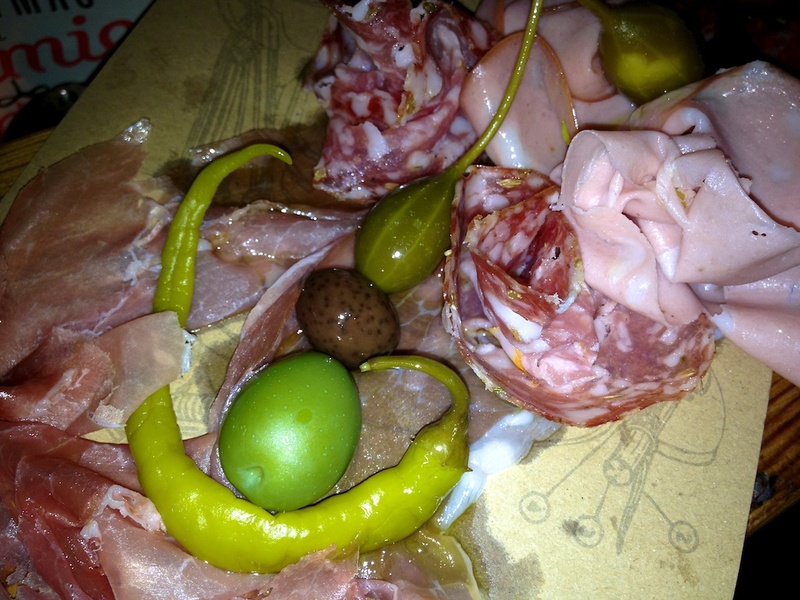 I choose the meat plate as a starter and it was top class – a selection of cured meats, mozzarella cheese and pecorino. Excellent quality ingredients – the ham was silky – and very nicely presented. The special winter vegetable soup looked good and was pronounced to be excellent. 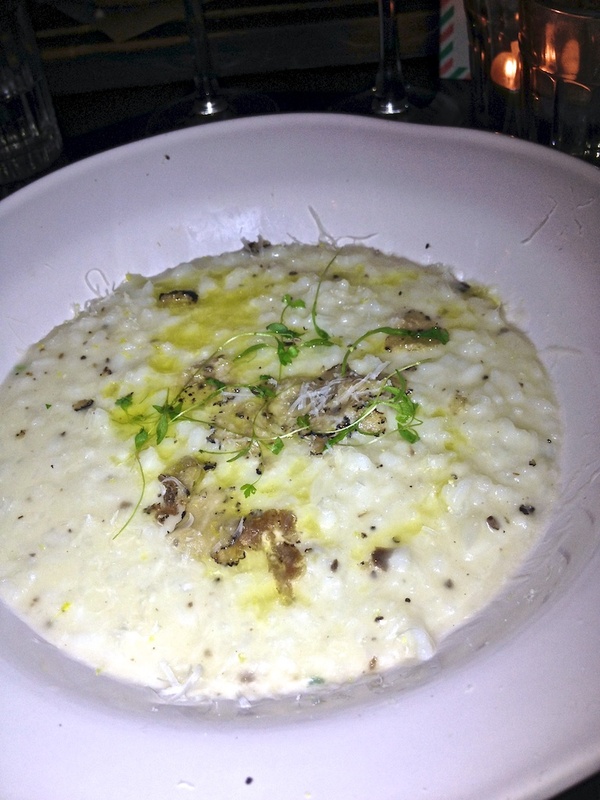 I was delighted to see that black truffle risotto, one of my favourites, was on the menu. It’s quite hard to get this right – a strong stock or too much butter can overwhelm the delicate truffle flavour. The chef here obviously tried to avoid this here but they went the other way – it was nicely flavoured with truffle but it really was rather watery – it needed some cream or mascarpone, I think, to add a bit of richness. I’m not sure what rice was used with it – very small grains. Not a problem although I probably prefer larger grain rice. 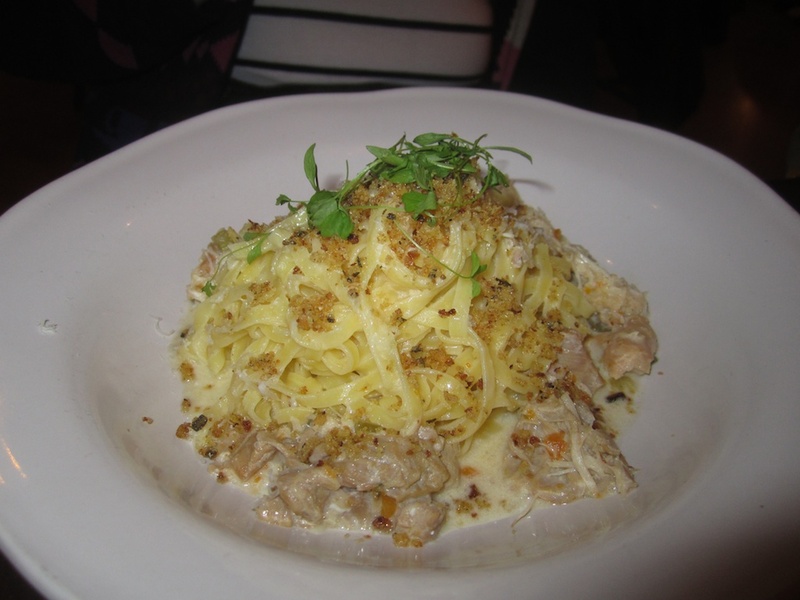 Others in our group were delighted with their main course pasta. The atmosphere in the resto was good – lots of buzz with diners of all types and ages from couples to larger groups. Excellent service from Andrew, our waiter. It was pretty noisy though so if you prefer quiet conversation, this is not the place for you. 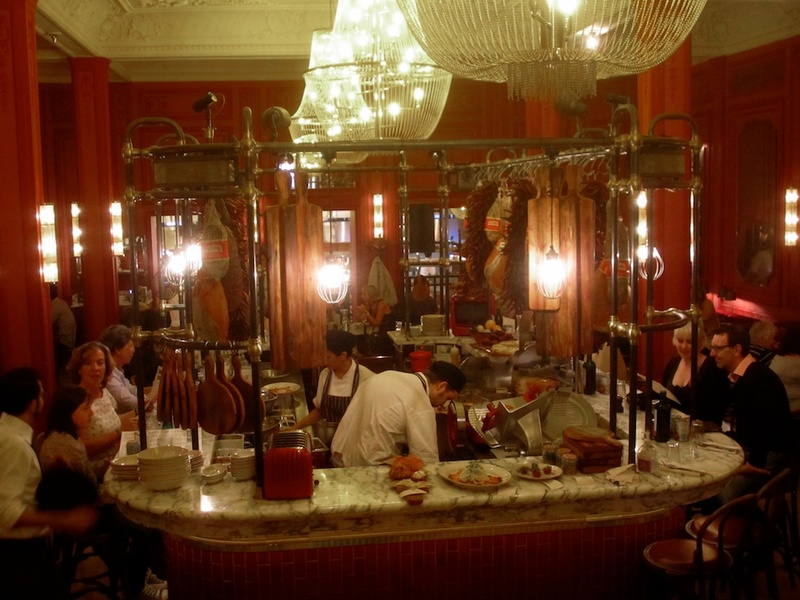 Would I recommend Jamie’s Italian – a definite maybe. I don’t think it is as good as Centotre along the road although it is probably a bit cheaper (we were about £30 each for 2 courses and 3 glasses of wine in Jamie’s). Nor is it nearly as good as Nonna’s on Morningside Road which, IMHO, is the best Italian resto in Edinburgh. The evening visit confirmed my lunchtime impression is that Jamie’s is OK, especially for a chain – I wouldn’t rush back but wouldn’t refuse an invitation to eat there either. But they really should think about the poor impression that the credit card thing behind the bar presents – given the technology they have, there should be no problem in linking the drinks tab to a booking. Apologies for the quality of the pics – the light was very poor and my phone flash is not up to much. The feted celebrity chef Jamie Oliver has a chain of Italian restaurants and the eponymous Jamie’s Italian has recently opened in Edinburgh. We haven’t tried it in the evening but I went in for a quick midday lunch with my wife and daughter, when I was between meetings. It’s quite a large space in the Assembly Rooms in George Street, decorated in dark red with no natural light (hence photos below are flash). There are tables on two levels with the lower level also including a central food bar, where salads, bruschetta, etc. are prepared. The restaurant was fairly quiet when we went in at 12.30 but by one o’clock it was almost full. We all just had a single pasta dish – Wild Rabbit Tagliolini, Sausage Papardelle, and Penne Arrabiata. Mine was the sausage – Italian sausage, which had a pronounced fennel flavouring with red wine and served with ‘crunchy, herby breadcrumbs’. It was good as were the tastes I had of the other dishes. It’s hard to judge somewhere from such a brief experience – the pastas were better than standard Italian average and certainly comparable with those in the better Italian restaurants. They were not overpriced. The restaurant had a very good atmosphere and friendly and helpful service. Certainly worth an evening visit and a more extensive menu exploration. 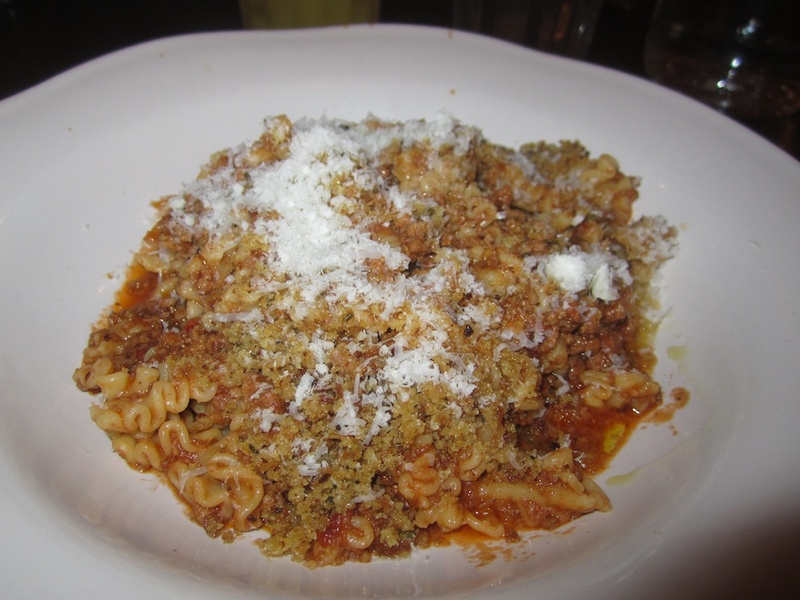 I’ve written about Nonna’s before and we always intended to go back. After getting home late from holiday on Saturday, we had no food in the house on Sunday so decided to go out for lunch. Everywhere was busy but Nonna’s managed to squeeze us in. As well as it’s normal menu, Nonna’s always has a lot of daily specials – mostly whatever fish are available that day. 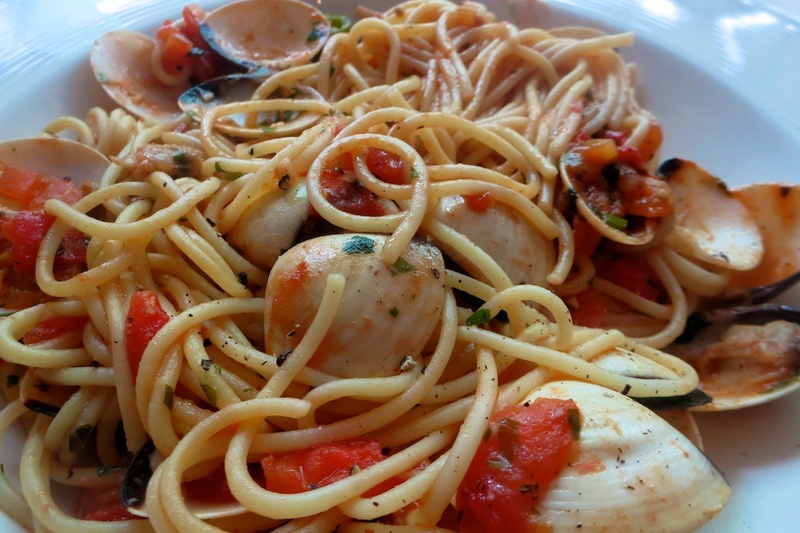 We all chose from the special menu – Anne had sea bass, Ali had linguine with giant prawns and I had spaghetti vongole – spaghetti with small clams. This was just clean tasting with the sauce flavoured by the juice of the clams. Just as good as the same dish which I’d had in Italy. The others were equally complimentary. The service and helpfulness of the staff in Nonnas is superb – it is remarkable how they can remember all the specials. But beware if you are ordering specials – they are not cheap and there are no prices on the blackboard. We went for a quick, cheapish lunch and ended up paying £20+ each for a main dish, glass of wine and coffee. But we thoroughly enjoyed it. Nonnas Kitchen is an Italian restaurant in Church Hill between Bruntsfield and Morningside. There have been various restaurants on this site over the years and the last time we were there the waiter dropped a piece of cauliflower in our water glass – indicative of both the quality of service and the food. So, we had never been back although the restaurant on the site had changed several times. Nonnas opened about a year ago and I had read several positive reviews so had thought that it was worth trying. 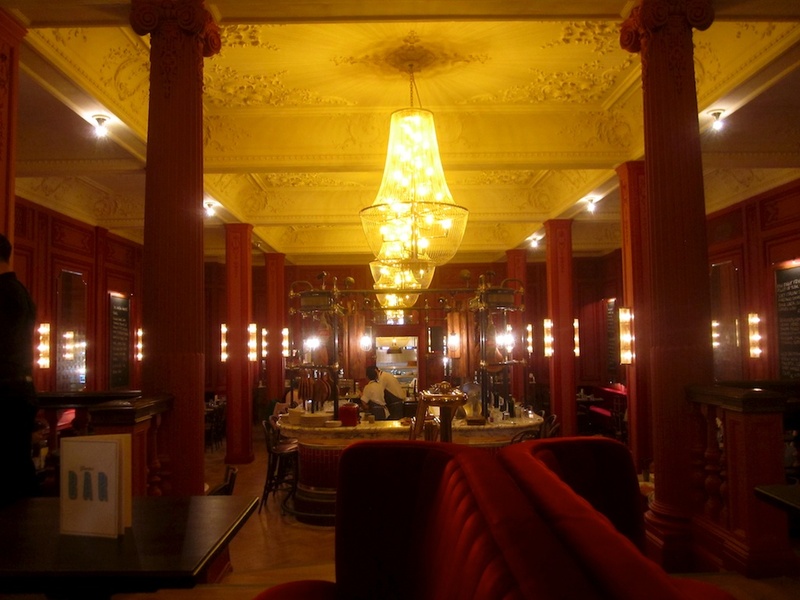 The reviews were right – the food, service and ambience were excellent. We went on a wet Wednesday evening – not the busiest time for most restaurants – and Nonnas was full. The standard menu seemed quite short but their were lots of mostly fishy specials. I started with pasta, cream cheese, mushrooms and Italian sausage which was rich and tasty. The Italian sausage was particularly good. Main course was sea bass with potatoes and vegetables – two sea bass fillets, which were fresh and perfectly cooked. Others had seafood pancake as starter, scallop and prawn ravioli and sole as main. Everyone was happy. Service was friendly and efficient – the staff really seemed to know what the specials were. With a bottle of Italian Sauvignon blanc wine (or a v. similar grape), we were about £30 each which given that we all had fish was not too bad. Most Italian restaurants in Edinburgh are pretty mediocre but Nonnas is definitely a cut above the rest. Recommended.